Scented Candles in Glass, 16 scents to choose from, BUY ONE GET ONE FREE!!! 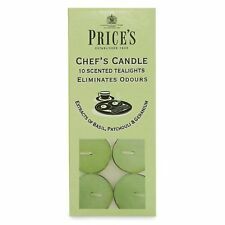 Scented Tea Lights 30 Pack, 14 scents to choose from, 4-5 hours burning time!!! KW1-KW17, PA20-PA38, PA41-PA49, PA60-PA78, PH4-PH44, PH49-PH50, PO (Isle Of Wight) TR (Isles Of Scilly) ZE (Channel Isles). 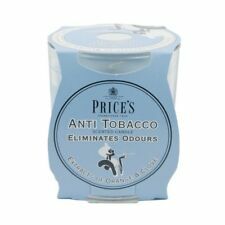 Lightly Scented To Remove Bad Odours. 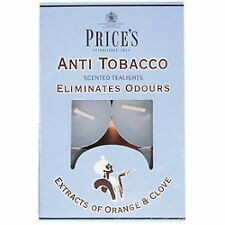 Anti Tobacco Tea Lights. 6cm Maxi Tea Lights. Languor Piccolo Candela Collection. Molton Brown. Limited Edition Gift Set. Imp's Whisper. 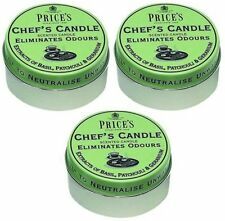 Aromatic Scented Candles. Anti Tobacco. Anti Tobacco Jar. 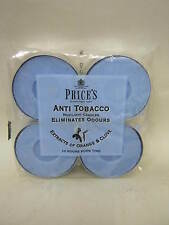 Price's Candles Candle Room Scenter Anti-Tobacco. Candle Height : 83 mm. Candle Weight : 349 grams. 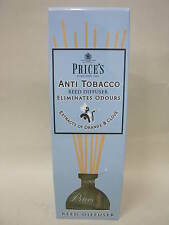 Price's Patent Candles Ltd started in 1830 and have been trading ever since in the UK. 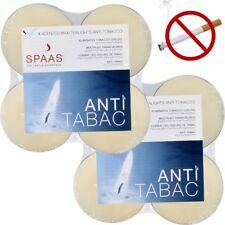 ANTI TOBACCO TEALIGHTS X 10. 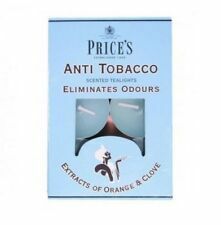 THE ANTI TOBACCO RANGE ELIMINATES SMOKING ODOURS WITH EXTRACTS OF ORANGE AND CLOVE WITH OUR UNIQUE ODOURFOYL TECHNOLOGY.